I recently tried linoleum cut print making for the first time, with positive but mixed results, I think. I done a few other types of simple print making but this is the first time I’ve made a linoleum cut. Basically, you take a piece of thick linoleum, a kind made specifically for print-making, draw you design on it, then use a carving tool to cut out whatever is not the print. You then run you paper through a printing press and make as many copies as you want. I do not have a printing press, so I had to apply the ink to the linoleum by hand for each print. And instead of a printing press I used a rolling-pin. I think the resulting post cards look better in person than they do in the photograph, but a printing press would have given me the clean results I really wanted. So now I’m looking into printing presses on the second hand market. I was inspired by this little bit of graffiti that I saw in New York during our recent vacation in Brooklyn. Some cheeky passer-by put this on a construction site fence that kind of looks a little bit like art, to be honest. I thought it would work well as a piece of mail art so I ran with it. I painted the paper I printed on before hand to kind of play with the way the various layers of paint and paper looked on the construction site fence. So now I have a couple of dozen past cards. If you’d like one, send me your mailing address privately and I’ll put one in the mail to you until I run out. You can email me at mrchestersir@gmail.com. Please put “mail art” in the subject line so I can keep you out of the spam file. These are great! I’ve never tried anything like this, but I’d say you did well, even without a real press. 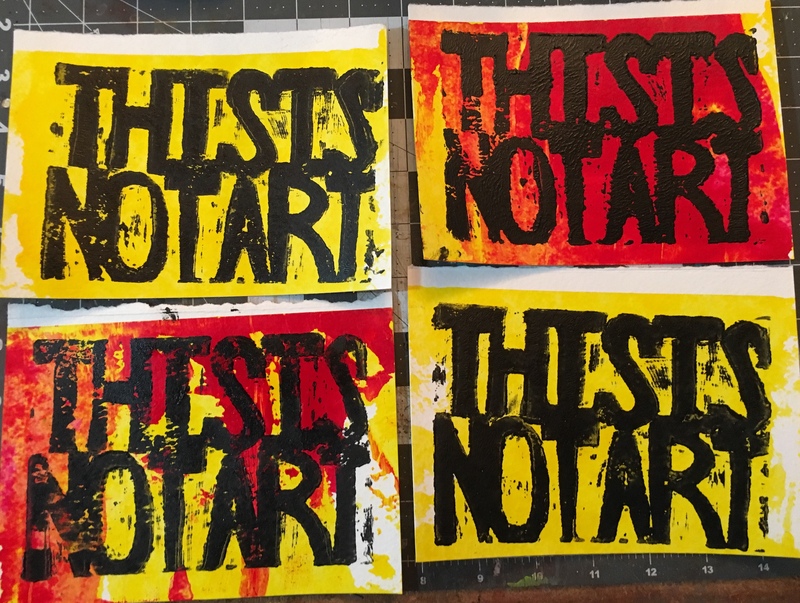 I have a friend who took some classes in this kind of printing, and it was clear from her experiences that it’s not as easy as it might appear. I think it would be fun to master the technique. What a lovely idea and your home-made plan of using a rolling pin was a work of genius. Hope you manage to find a little printing press!